Start using Docker now! These are the basics to get up and running, along with a few important points on how to best use Docker. While a Virtual Machine is a whole other guest computer running on top of your host computer (sitting on top of a layer of virtualization), Docker is an isolated portion of the host computer, sharing the host kernel (OS) and even its bin/libraries if appropriate. To put it in an over-simplified way, if I run a CoreOS host server and have a guest Docker Container based off of Ubuntu, the Docker Container contains the parts that make Ubuntu different from CoreOS. This image is found on these slides provided by Docker. Docker isn't compatible with Macintosh's kernel unless you install boot2docker. I avoid that and use CoreOS in Vagrant, which comes with Docker installed. I highly recommend CoreOS as a host machine for your play-time with Docker. They are building a lot of awesome tooling around Docker. # This will require sudo access when using "vagrant up"
If you're not using CoreOS, then check out this page with install instructions for other flavors of Linux. Note: Ubuntu is what Docker develops on, so that's a safe bet. If you are using CoreOS, dont be dismayed when it tries to restart on you. It's a "feature", done during auto-updates. You may, however, need to run vagrant reload to restart the server so Vagrant set up file sync and networking again. This is the unfortunate baby-step which everyone needs to take to first get their feet wet with Docker. This won't show what makes Docker powerful, but it does illustrate some important points. 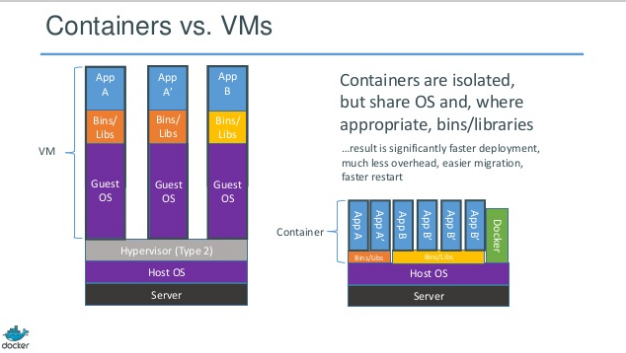 Docker has a concept of "base containers", which you use to build off of. After you make changes to a base container, you can save those change and commit them. You can even push your boxes up to index.docker.io. One of Docker's most basic images is just called "Ubuntu". Let's run an operation on it. If the image is not already downloaded in your system, it will download it first from the "Ubuntu repository". Note the use of similar terminology to version control systems such as Git. Nothing happened! Well, actually it did. Run docker ps (similar to our familiar Linux ps) - you'll see no containers listed, as none are currently running. Run docker ps -a, however, and you'll see an entry! So, we can see that docker did run /bin/bash, but there wasn't any running process to keep it alive. A Docker container only stays alive as long as there is an active process being run in it. You'll see you are now logged in as user "root" and can poke around the container! We can see that just by logging into bash, we created a .bash_history file, a /dev directory and a /dev/kmsg file. Minor changes, but tracked changes never the less! Docker tracks any changes we make to a container. In fact, Docker allows us make changes to an image, commit those changes, and then push those changes out somehwere. This is the basis of how we can deploy with Docker. Let's install some base items into this Ubuntu install and save it as our own base image. You'll notice a ton of Ubuntu's here. Since I first used the Ubuntu base image, it loaded knowledge of the variously tagged versions of Ubuntu they have available on the Docker index. More excitingly, however, is that we also have our own image fideloper/docker-example and its tag 0.1! 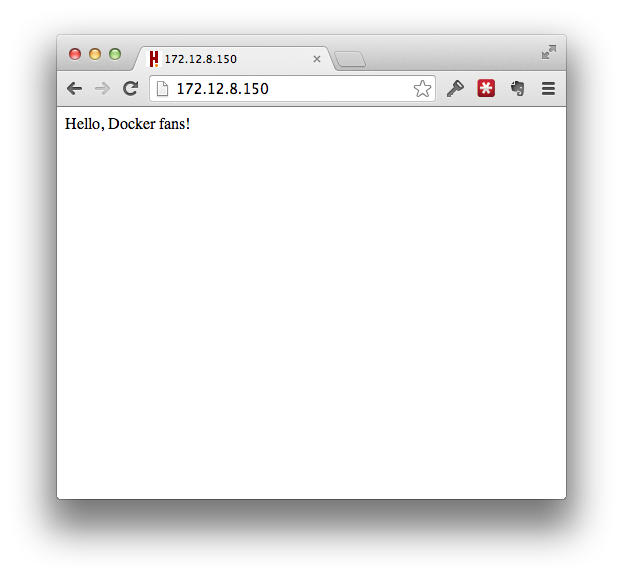 Let's move onto building a static web server with a Dockerfile. The Dockerfile provides a set of instructions for Docker to run on a container. This lets us automate installing items - we could have used a Dockerfile to install git, curl, wget and everything else we installed above. Create a new directory and cd into it. Because we're installing Nginx, let's create a default configuration file that we'll use for it. That's about as basic as it gets for Nginx. RUN will run the given command (as user "root") using sh -c "your-given-command"
CMD will run a command (not using sh -c). This is usually your long-running process. In this case, we're simply starting Nginx. Once that's saved, we can build a new image from this Dockerfile! docker build -t nginx-example . If that works, you'll see Successfully built 88ff0cf87aba (your new container ID will be different). Let's run this web server! Use docker run -p 80:80 -d nginx-example (assuming you also named yours "nginx-example" when building it). The -p 80:80 binds the Container's port 80 to the guest machines, so if we curl localhost or go to the server's IP address in our browser, we'll see the results of Nginx processing requests on port 80 in the container. To fix this, let's share a directory in between the Container and our host machine. First, create an index.html page from where we'll share it. -v /path/to/host/dir:/path/to/container/dir:rw - The volumes to share. Note rw is read-write. We can also define ro for "read-only". -p 80:80 - Bind the host's port 80 to the containers. ...or better yet, point your browser to your server's IP address! Note that the IP address I used is that of my CoreOS server. I set the IP address in my Vagrantfile. I don't need to know the IP address given to my Container in such a simple example, altho I can find it by running docker inspect <Container ID>. Not fully covered here (for now) is the ability to link two or more containers together. This is handy if containers need to communicate with eachother. For example, if your application container needs to communiate with a database container. Linking lets you have some infrastrcture be separate from your application. In this example, the some-application-image will have environment variables available such as DB_PORT_3306_TCP_ADDR=172.17.0.8 and DB_PORT_3306_TCP_PORT=3306 which you application can use to know the database location. So, we fairly easily can build servers, add in our application code, and then ship our working applications off to a server. Everything in the environment is under your control. In this way, we can actually ship the entire environment instead of just code. I always use Phusian's Ubuntu base image. It installs/enables a lot of items you may not think of, such as the CRON daemon, logrotate, ssh-server (you want to be able to ssh into your server, right?) and other important items. Read the Readme file of that project to learn more. Especially note Phusion's use of an "insecure" SSH key to get you started with the ability to SSH into your container and play around, while it runs another process such as Nginx. Orchard, creators of Fig, also have a ton of great images to use to learn from. Also, Fig looks like a really nice way to handle Docker images for development environments.